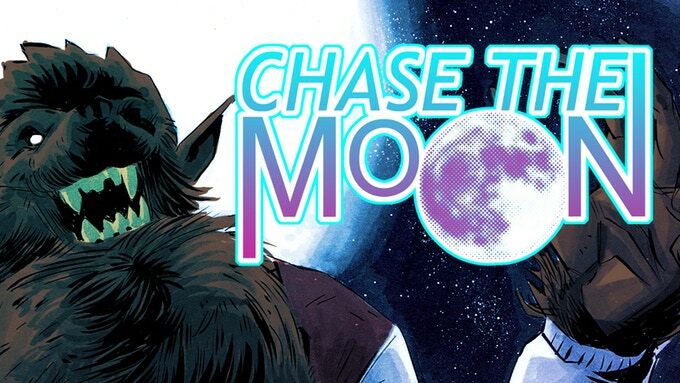 Kickstarter Alert: If you are a werewolf fan, be prepared to "Chase the Moon" – AiPT! Kickstarter Alert: If you are a werewolf fan, be prepared to "Chase the Moon"
Fan of horror, the 80s, and werewolves? Then you are going to want to back Chase the Moon! Even though the holidays are closer to us than Halloween, it doesn’t mean that we can’t enjoy a little bit of blood to go along with our eggnog and chocolate pie. Stuff your stockings with some flesh and check out the story for the Chase the Moon, a new horror tale by Bob Franz and Kevin Cuff, and artwork by Drew Moss. If you are a horror fan AND an 80s fan, how can you turn your back to funding this 100-page graphic novel? Perks range from digital PDFs, to the real book, and if you throw in enough dough, you can get sketches from Drew Moss! The kickstarter has less than 48 hours to go. Jump over to the Chase the Moon Kickstarter and give these talented cats some cash to make their book a reality!